Q: What software do you recommend for use with VO auditions at home? Depending upon how involved your at-home setup is, your software choices will change. Let’s take a look at various options, beginning with a free, high quality, open source software choice. 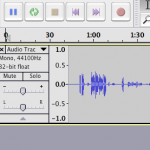 Audacity is remarkably easy to use, launches quickly, and is ready to record instantly. It works well with the Audio-Technica AT2020 USB Microphone . You can use Audacity with any microphone you can successfully connect to your computer, including all USB mics and any studio mic connected via a bridge.